Yes, you’re here to learn Korean. So, let me tell you up front. “Ne” means “Yes” in Korean. If that’s the only word you need to know, now you’re done. But, if you want to learn more, keep on reading. 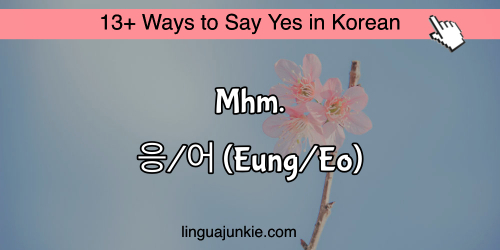 This quick Korean lesson will give you all of the ways of saying yes and agreeing in Korean. 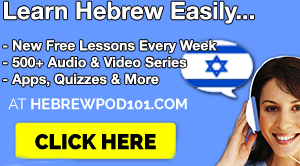 Now, as you read these, be sure to listen to this free audio lesson too. Why? You get to hear REAL Korean pronunciation. So, press the play button now. Anyway, let’s move on to more ways to say yes in Korean. It sounds like the English word “yeah.” So, you will remember this Korean word for sure. It is also a polite way to say yes. “네” and “예” are interchangeable in most cases. The only difference is that “예” sounds a little bit more polite than “네”. So, you would usually use “예” with older people who you want to be very polite respectful, in situations like you are meeting your significant other’s parents for the first time. 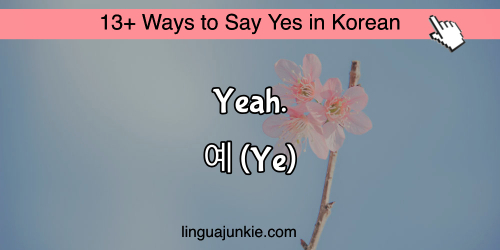 응 and 어 are informal ways to say yes in Korean. Completely interchangeable. You need to be careful with these expressions, however, because they are informal versions. Be sure that you do not use them with people who are older than you or someone you don’t know. Otherwise, they might feel offended and ask you to speak politely! Whoa, three different ways to say okay in Korean? Don’t be overwhelmed. All you need to do is to choose a politeness level. If you want the most formal and polite version, go with the first one, “Algesseubnida.” If you want to use a somewhat formal at a standard polite level, choose the second one, “Algesseoyo.” If you want to be informal, use the third one, “Algesseo”. You can use these when you are consenting or agreeing. The example you see below is in the polite version. Now you know how to say okay in Korean. 5. That’s correct. That’s right. Why are these 3 ways? The same as the above It depends on the politeness level. The first one is the most polite and the last one is the least polite (informal). You can use them when someone is expressing an opinion and you want to express your approval or agreement. Also, you can simply confirm some fact is correct. 6. It is so. Yes, it is. These Korean phrases are used to assure something is true. Unlike the phrases in number 5, you don’t use them when you agree with an opinion. 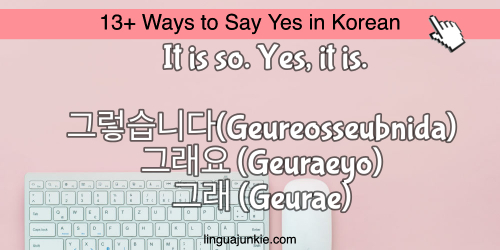 You say these after a simple yes, for example, “예, 그렇습니다”, “네, 그래요”, or “응(어), 그래”. Fun fact: the last one, “응, 그래.” often used sarcastically among young people, like you would say “YEAH, SURE…” in English. When someone expresses his/her opinion and you agree with it, say these. These phrases have almost the same usage of “I agree” in English. For example, when you sign up for a website, the website will ask you to check next to “Donguihabnida” to make sure that you agree to the terms and conditions. Want to get some pizza? Chanseonghaeyo! Yes! You can use these when someone suggests something and you are for it. Basically, you are agreeing to do something by saying “Chanseonghaeyo” But, note that this is different from the phrases in number 8. In #8, you use those to agree with someone. Here, “Chanseonghaeyo.” is used when you want to vote in favor of something. But in Korean, if the question is negative, your answer will be the opposite of what you would say in English. That said, sometimes “네” can mean “no”. For example, when someone says “학생 아니죠? (You’re not a student, right)?” and you say”네(yes)”, you mean you are not a student. So please pay attention whether the question is in positive or negative! 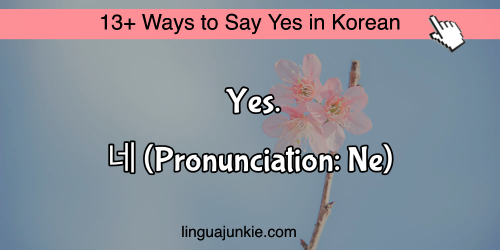 So, by now you know that “Ne” is the easiest way to say yes in Korean. 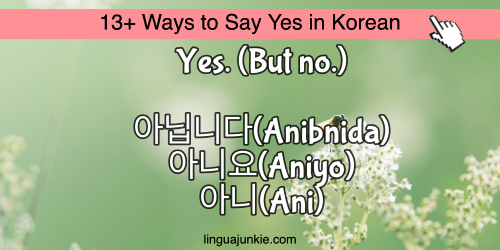 So, here are a few more Korean “yes” phrases to help it sink in. 11. Yes, I’m very hungry. 12. Yes I like it. 13. Yes, I can kind of speak Korean. ne, eoneu jeongdo hal su isseumnida. 네, 어느 정도 할 수 있습니다. 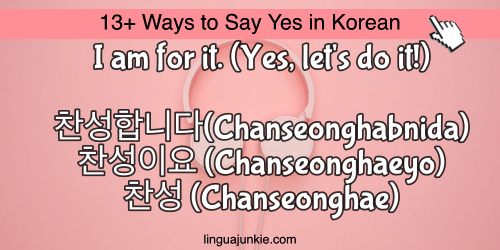 Now, you know a whole bunch of ways to agree and say YES in Korean. Why is this important? Well, it means you can now express yourself in many ways. And that means you’re closer to fluency. Fluent people are able to express themselves in many ways and choose the most accurate phrases. Want to keep this lesson? Print it out and re-read it every now and them! P.S. Want to speak Korean with an easy 3 minute lesson? Then check out KoreanClass101.com. 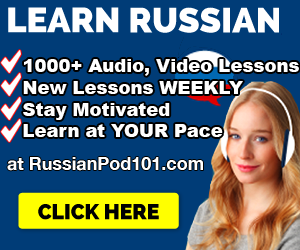 They have 3-10 minute audio/video lessons that get you speaking and understanding Korean. 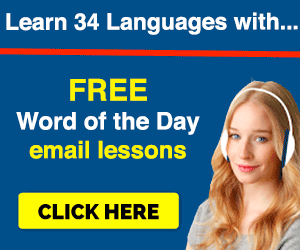 So, if you want to speak and learn this language, press play on a lesson and off you go. 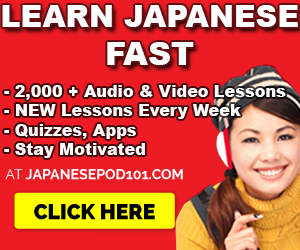 Previous Previous post: Is Japanese Hard to Learn? Your Easy Guide to Japanese.